To sign up to the Grandstand Motor Sports Newsletter, simply click the Request Newsletter button below and you will receive amazing special offers, discounts and access to secret sales. Experience - Our knowledge, expertise and passion is unrivalled and there are few circuits that we haven't visited in person. We know the best areas to stay, what to do at the circuits and the best places to dine at night. Tailor-made itineraries - we know that many fans' travel requirements are different, which is why we work with our customers to tailor-make a personalised trip itinerary that suits their needs. Our flexibility and commitment to customer service is one of the reasons that 60% of customers travel with us again. Regional flight options - If it suits you better to fly from your nearest regional airport, then that's fine. We will do our best to book flights from your most convenient airport, subject to availability. 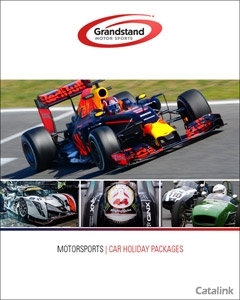 Sign up today to receive the latest news, offers and trip information from Grandstand Motor Sports and be the first to find out about exclusive product launches. By Pressing the Request Newsletter button you give Grandstand Motor Sports (and their Data Processors for the specific purpose of delivering your emails) consent to send you their newsletter via email until such time as you choose to unsubscribe.